Hold Me is the debut EP by the American Christian hip hop artist, Jamie Grace. In addition to TobyMac being featured in the title track, the EP was produced by TobyMac and was released on his label, Gotee Records. "Into Jesus", listed as the second track, is a cover of a 1998 DC Talk song. ↑ "Jesus Freak Hideout review". Jesusfreakhideout.com. February 22, 2011. Retrieved February 18, 2012. ↑ "New Release Tuesday review". Newreleasetuesday.com. February 22, 2011. Retrieved February 18, 2012. 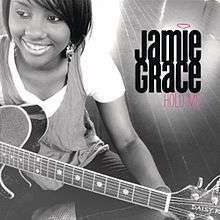 1 2 "Jesusfreakhideout.com: Jamie Grace, Hold Me EP Review". Jesus Freak Hideout. Retrieved April 8, 2011.